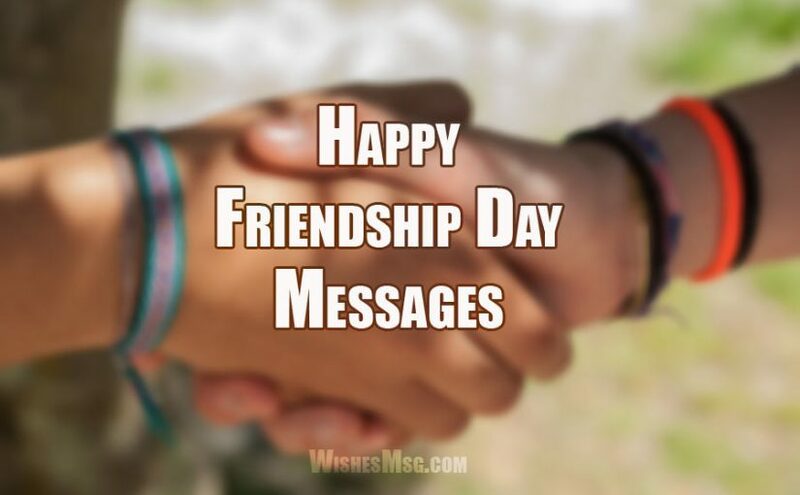 Happy Friendship Day Wishes 2018 : Finding appropriate messages for special ones on special occasions is hard nowadays. Most of what you’ll find on the internet is published probably a decade ago and websites not been updated with new messages. 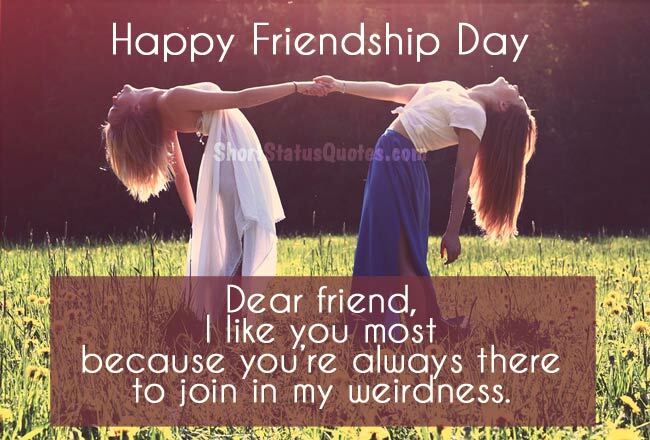 So, keeping that in mind, we have brought some of the most wonderful, amazing friendship day messages for you. 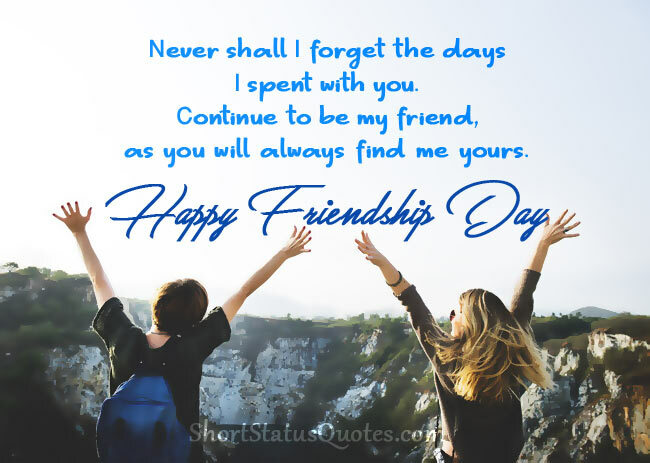 Here you can find happy friendship day messages for a best friend, for a female best friend or some funny friendship day messages if you want! Lucky are those who have found a soulmate in their friend. you are much more than a friend to me. You mean a lot. Happy friendship day 2018! No one needs to count material wealth when they have a friend like you. You are the most wonderful friend I could ever wish for. I wish you a very happy friendship day. Its hard to find someone who will stay with you in your hard times, someone who will help you rise up again after you fall. Fortunately for me, that person is you! You are a rare gem, my friend! There is just so many people around me but only one person that allows me to be myself is you. This special day is entirely for the person I call my best friend. Every day is special if spent with you. you make me forget what boredom is. I never thought anyone could ever touch my life in so many ways. Happy friendship day! On this very special day, I want to let you know that you are my most favorite person in this world. I enjoy your company more than I enjoy myself. Happy friendship day to you! You are everything that a true friend can be. You are the most precious gift from God. I wish that we remain best friends for the rest of our life. Wishing you a very happy friendship day! God has been so generous to me by giving me such a friend like you. So, for me, this friendship day is not only a day to celebrate our friendship but also a day to be thankful to God for the gift. People do not just meet and end up being best friends. It requires two independent minds to think alike and two beautiful souls to share the same road in life. Happy friendship day 2018! It takes a lifetime to find a person like you in this twisted world. I felt lucky right at the moment I met you. But having you as a best friend is way more than I expected. I wish you a happy friendship day! No matter what I wish for you on this special day, it will not be enough to express the feelings I have for you. you always have a very special place in my heart. Happy friendship day! On such a special occasion, let’s take an oath that no matter what life unfolds before us, no matter how difficult time gets for us, we will always be a best friend to each other. Happy friendship day dear friend. You are not just a best friend but also a brother to me. I may not always express my feelings, but I do care a lot for my best friend. Happy friendship day! Let’s put aside all the little problems between us and let’s embrace each other with the same smile and the same feelings of eternal friendship. Because, my best friend, today is friendship day! After another wonderful year of friendship, this day has come yet again to remind us how much we mean to each other. Happy friendship day to my dear best friend! You may not be the nicest person in this world. but to me, you are the most wonderful person and the most amazing best friend in this world. Wishing you all the best on this occasion. You are an angel sent directly from God to guide me in my difficult times. You are the sweetest, coolest and loveliest female friend I have ever had. Happy friendship day dear. The best thing in the world is probably having a girl as a best friend. It feels so much easy to express myself to you. This special day is only for you! The only person in this world that understands me more than even myself is you. I never thought I will find my bestie in a girl. Long live our friendship! As beautiful as you are, you have also made our friendship a collection of beautiful moments. It’s a blessing to have you as a best friend. You will always be loved and respected. Happy friendship day! When I first met you, it was like meeting another person with an attractive face. But when I got to know you, I found there’s a beautiful soul hiding beneath the outer beauty! I am lucky that you are my best friend! My life is awesome because you are in it. This special day is to remind you that I am grateful to you for all the greatest moments of my life. Happy friendship day! You fill my days with colors of joy and happiness. On this very special day, I wish to do something special for you too! but before all that I want to wish you a very happy friendship day! I may not become the perfect friend for you, but for me, I could never find a friend more perfect than you. You have made our friendship great! Happy friendship day to you! Happy friendship day. Today we are going to pretend like the most amazing friends ever to each other and forget everything about being just two random vagabonds. Since I made friends with you, I have come to realize that life is more enjoyable with a living cartoon around you. However, let’s make this friendship day great! It’s friendship day today and you are still alive to celebrate this day with me. How lucky you are! I really hope I won’t kill you before the next friendship day! Sending you to love anyway! It’s another friendship day for both of us to go back in the memory lane and find out what mischiefs are missing there. So, we can add them in this coming year! Happy friendship day! I am sending this message not because you are my best friend but because if I don’t do this you’ll knock me in the face. Happy friendship day! Friendship is something that cannot be seen but felt. Thank god! because it would be so hard to see a stupid face and then make a friendship. Bytheway, happy friendship day! Make friendship with dumb people and feel superior all the time. That’s what I did when I first met you. Happy friendship day! I envy you because you got to meet such a wonderful person like me. Truly, God has blessed you a lot in life. anyway, happy friendship day! Make this friendship day awesome for your friend with this amazingly wonderful friendship day wishes messages. You’ll not regret choosing any one of the above for wishing your best friend.